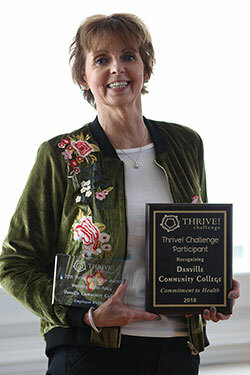 (November 1, 2018) – Danville Community College (DCC) was recognized for participating in the 2018 Thrive! Challenge by The Health Collaborative during the 2018 Health Summit on Thursday, October 25, with special recognition for the college’s initiative on improving health policy on campus. DCC employees were challenged for several months this summer to try and make positive changes in their daily routines, such as drinking more water or taking breaks from sitting at their desks. The idea for DCC’s campus was developed by Holley and DCC Counselor JoLane Tilley. Danville Community College is a two-year institution of higher education under the state-wide Virginia Community College System. DCC's service area includes the City of Danville, Pittsylvania County, and Halifax County. For more information about the college’s more than 100 programs of study, visit www.danville.edu.